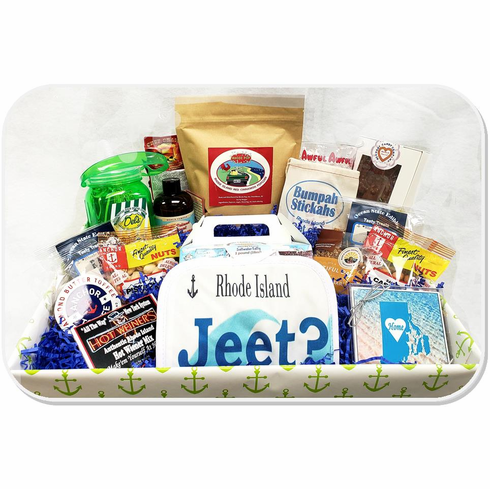 This sensational gift basket combines all the best flavors of Rhode Island. We've included Del's Lemonade mix & sports bottle, NY System Hot Wiener mix, Artisan RI chocolate, 1 lb. Salt Water Taffy, Rhode Island Original Coffee Syrup, our exclusive "Jeet?" potholder, Beautiful Day Granola, Ocean State Edibles Sweet & Savory snack mix, Anchor Toffee, Newport Candy Co. artisan chocolate lobster, Rhode Pop Gourmet Popcorn, Chef Craig's Beef Jerky, Newport Creamery Awful Awful Cup, Anchor Brand Cashews & Peanuts, and Set of 4 Rhode Island Bumper Stickers, and a custom Ceramic Coaster by Coaster's Harbor Co.. WOW! Ya gotta love the Ocean State. Enjoy!